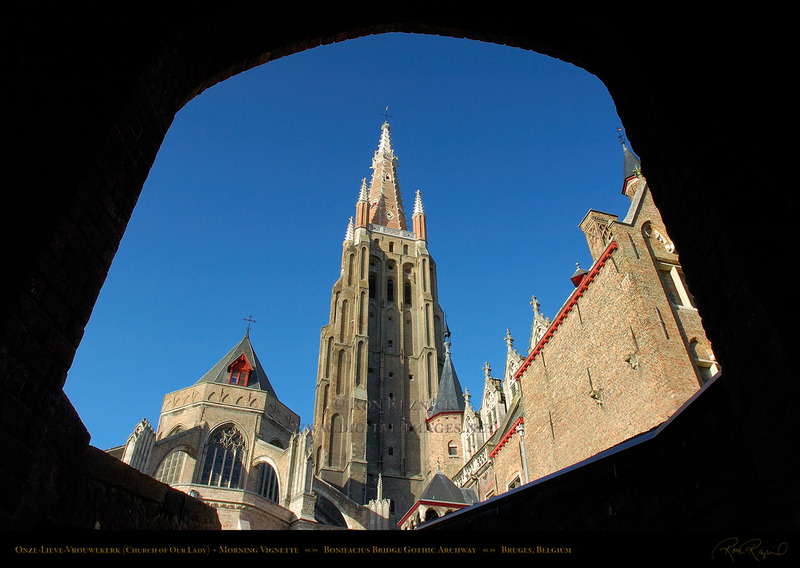 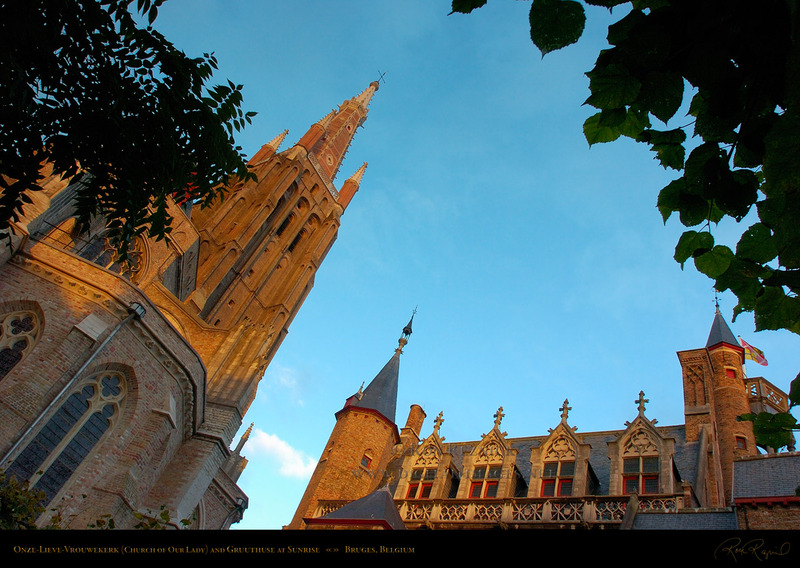 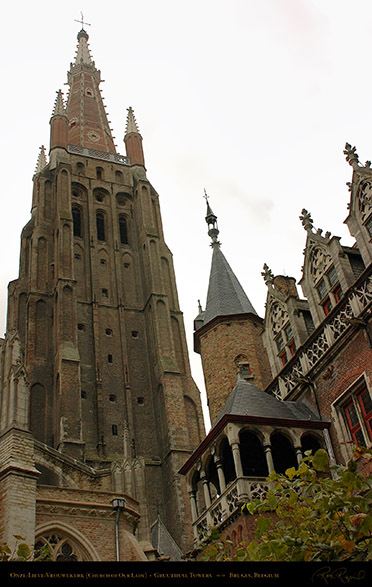 Onze-Lieve-Vrouwekerk (Church of Our Lady) is one of the most notable landmarks in Bruges. 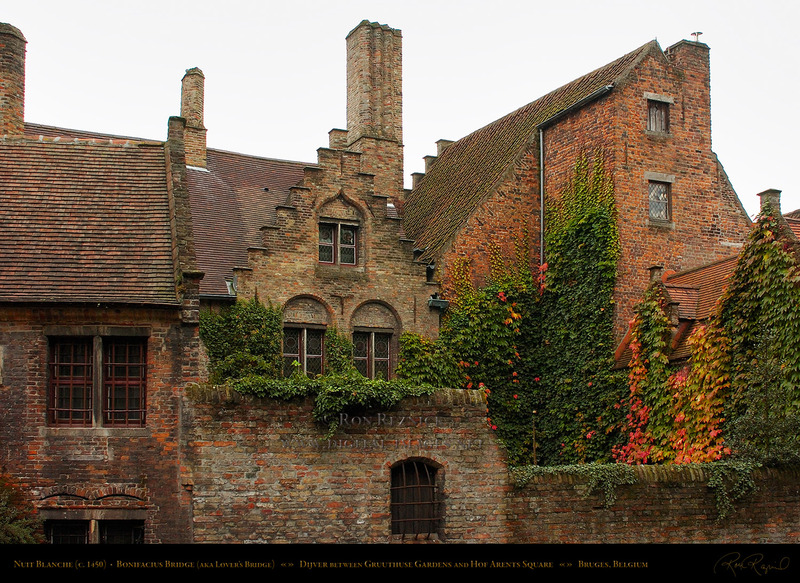 prior to the conversion to hops-based beer from recipes brought from Bavaria in the 15th century. 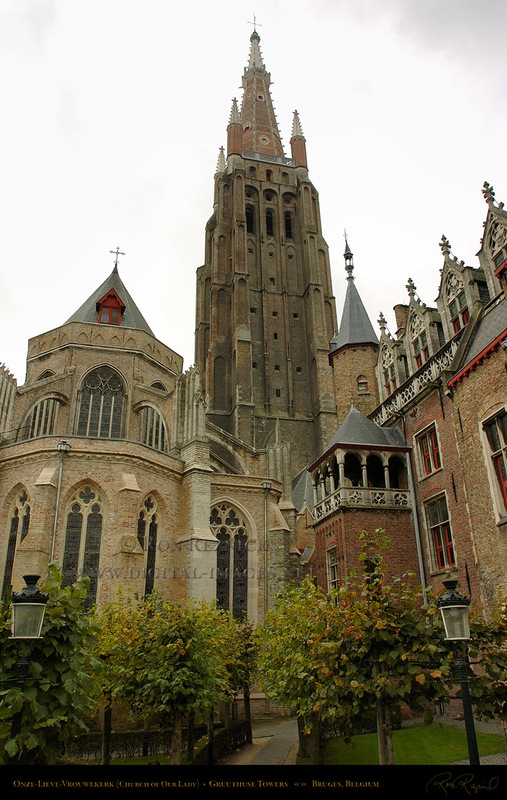 Onze-Lieve-Vrouwekerk (Church of Our Lady) was begun in 1250 and completed in 1440.
phase of construction (ending in 1440). 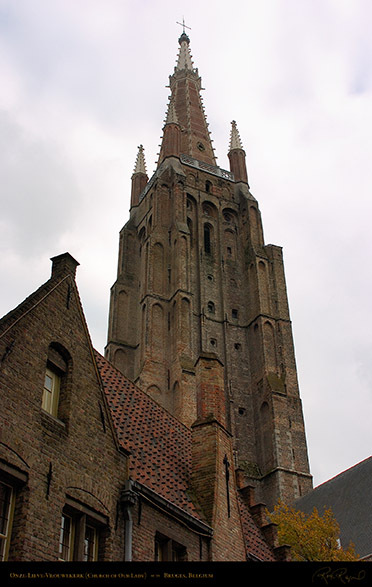 The 54 meter (177 ft.) central spire was begun in 1444.
section is built with moefen, large bricks which are typical of early medieval brick buildings. 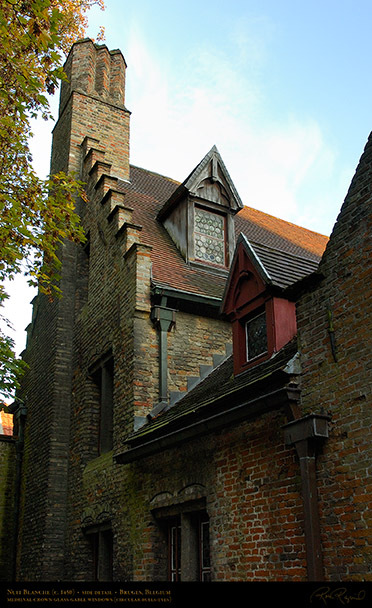 OLV replaced the Carolingian Chapel which dated from 875. 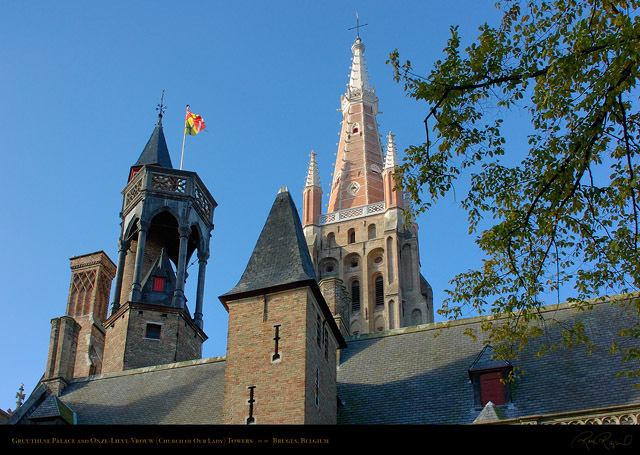 This original Romanesque church was destroyed by fire in 1116.
towers and dormers of the Gruuthuse (on the right). 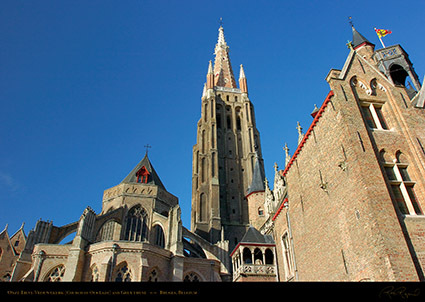 flying buttresses was built in the French High Gothic style. 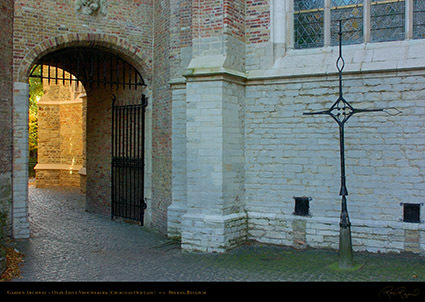 At left is the OLV garden gate archway and Rectory #2 at the end of Onze-Lieve-Vrouwekerkhof-Zuid (Church of Our Lady Court South). 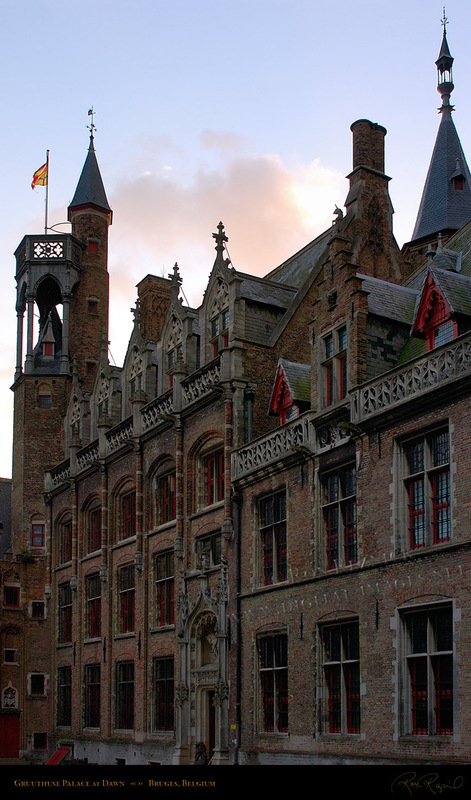 The Neo-Gothic building (built in 1911) with its dormer window and stepped gable stands at the end of the street shown above, which is populated with houses exhibiting Neo-Classical, Neo-Renaissance, Art-Nouveau and Baroque styles. Many of the buildings on this street were renovated or built in the early 20th century to replace earlier structures built on the site of the old church cemetery, but the 16th century shops at the end of the street (out of picture to the right) still stand, although they were rebuilt in the late 19th century. 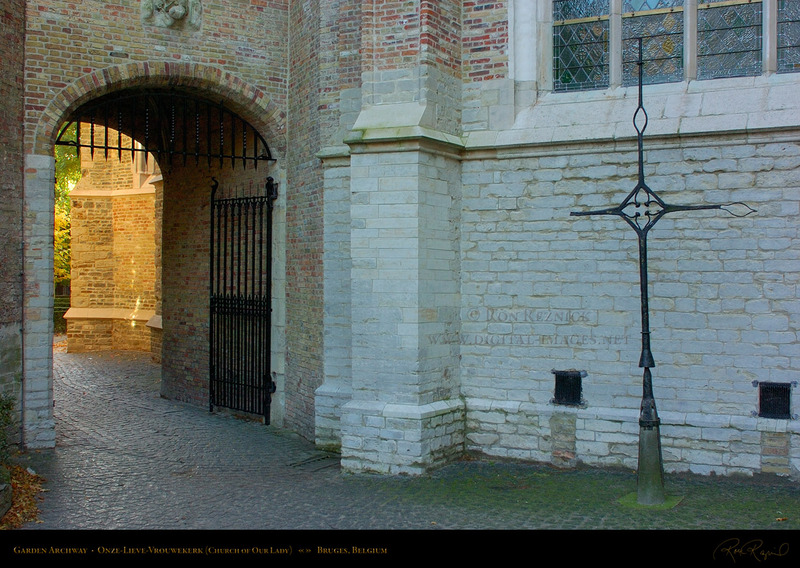 At the opposite end of the street from the OLV garden gate is the south entrance to Onze-Lieve-Vrouwekerk (below). The Madonna and Child and ornate Gothic lunette sculpture over the South (primary) Entrance to Onze-Lieve-Vrouwekerk. 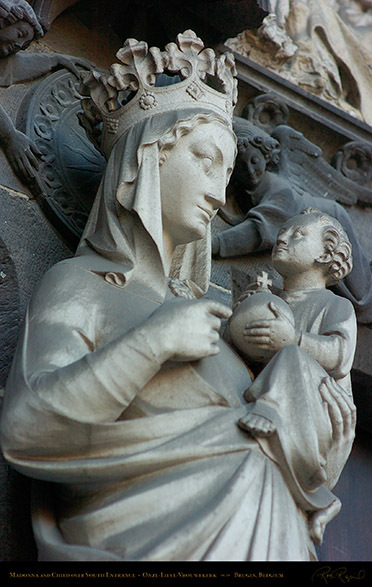 Detail of the Madonna and Child over the South Portal at the Mariastraat and Onze-Lieve-Vrouwekerkhof-Zuid intersection. 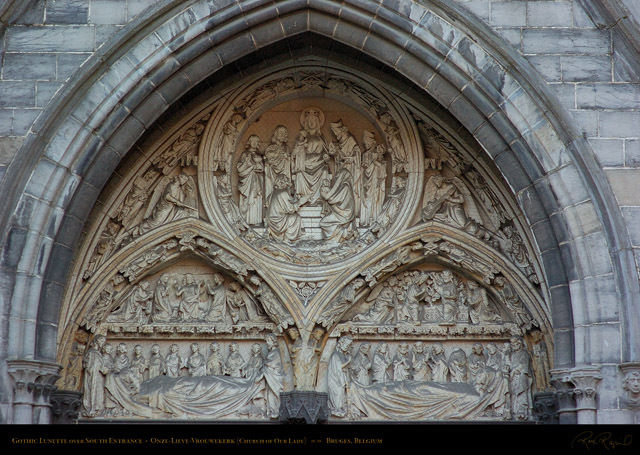 and the Virgin Mary and Child surrounded by attendants in the central tondo. This is above the sculpture of the Madonna and Child which stands over the South Portal. 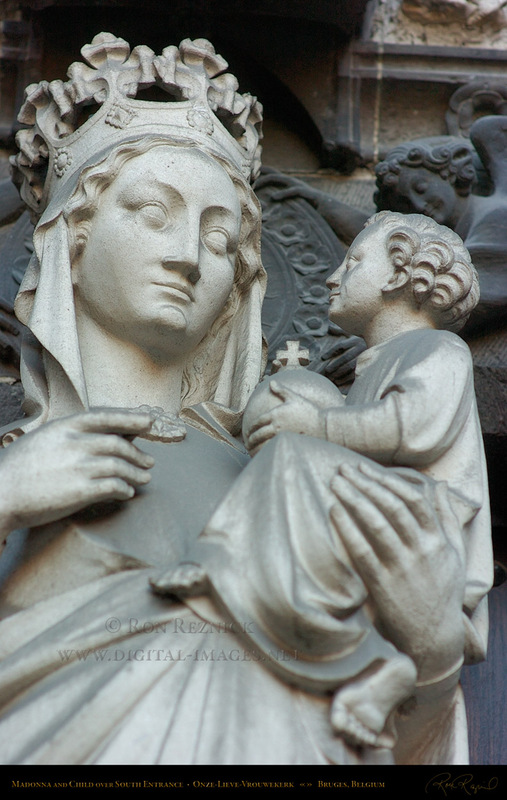 Frontal detail of the South Entrance Madonna and Child. 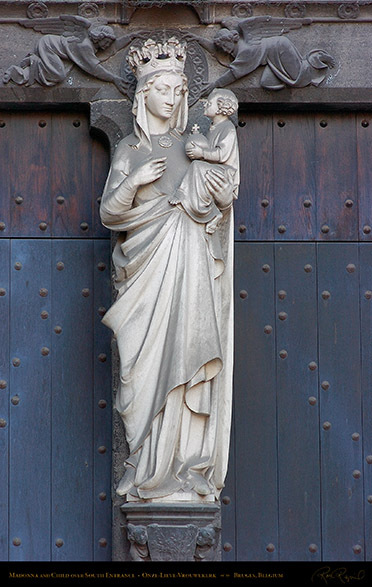 Side detail of the South Entrance Madonna and Child. 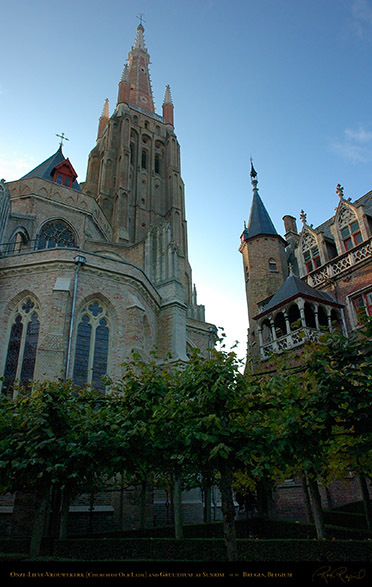 from the garden behind the Onze-Lieve-Vrouwekerk. The Scheldt Gothic Turret on the west facade, a High Gothic Flying Buttress, and the Gothic Brickwork Tower. The blue Tournai Stone west facade is the oldest part of the church. 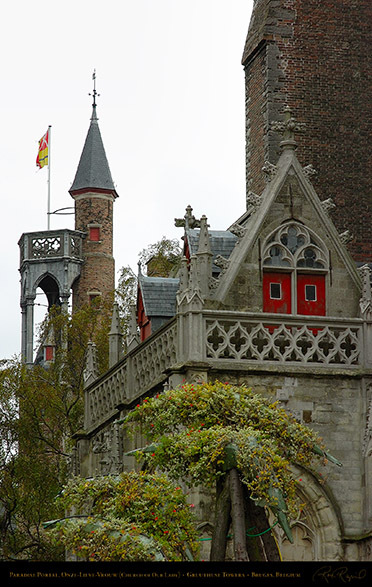 Detail of the Scheldt Gothic Turret, west facade (c. 1230-80). 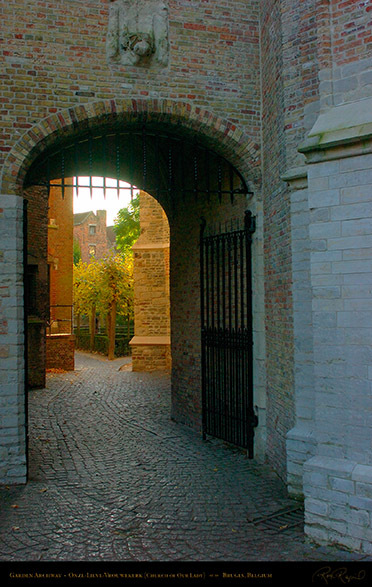 The North Entrance to the garden behind Onze-Lieve-Vrouw, under the archway bridging the gap between the Gruuthuse and Onze-Lieve-Vrouwekerk. This is just beyond the courtyard of the Gruuthuse between the Palace and Museum, shown in the section below which details the Gruuthuse. Right is a detail shot of the archway and the garden beyond. The North side of the Church and the Gruuthuse Courtyard are accessible from Guido Gezelleplein, opposite St. John’s Hospital (Sint-Janshospitaal, one of the oldest hospitals in Europe). 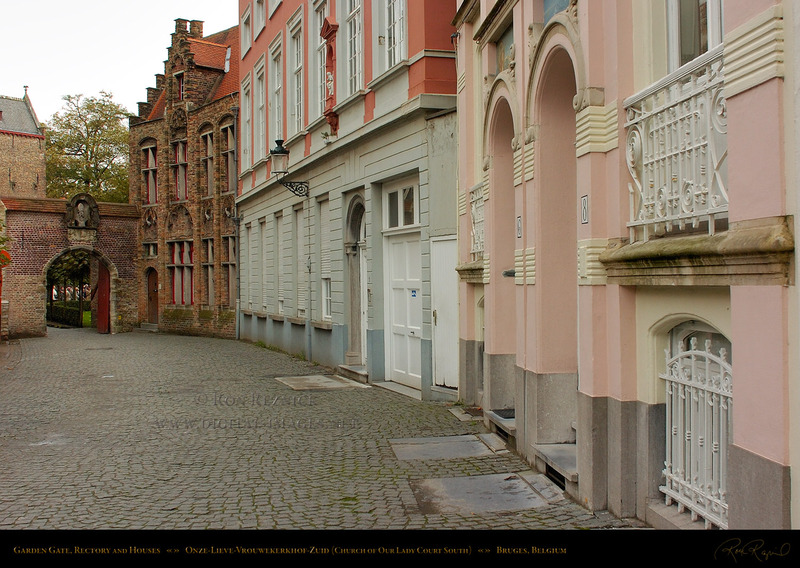 Images of the Mariastraat facade, the oldest part of the hospital, and others are on the Houses and Buildings and Canals and Street Scenes pages. Onze-Lieve-Vrouwekerk and the Gruuthuse at sunrise from the gardens behind the church. at sunrise from the gardens behind the church. is not parallel to the subject to create a dramatic effect. These three shots were taken with the camera on the floor of the Bonifacius Bridge Archway. 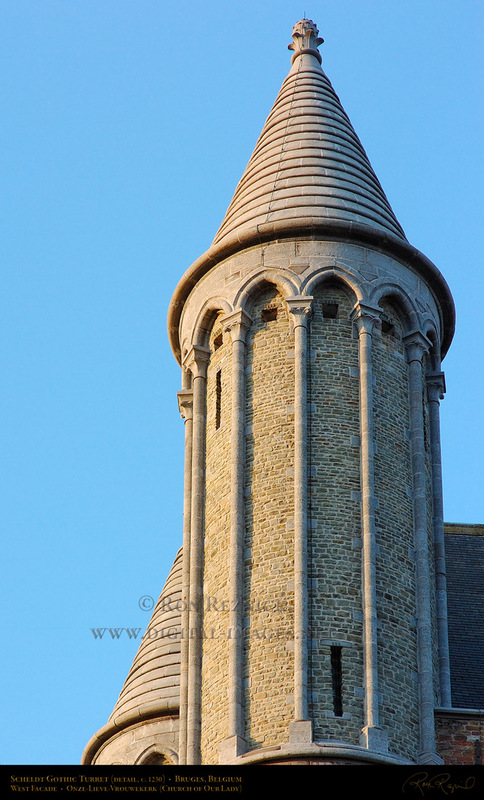 You would not believe the radical contortions which I had to go through to line up these shots. 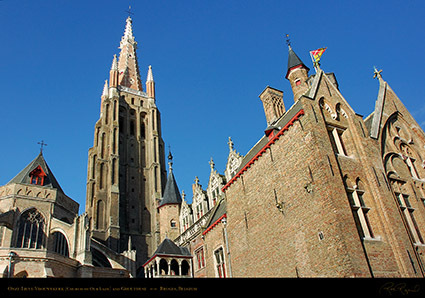 the 122 meter Gothic Brickwork Tower, and the Gruuthuse Palace on the right. 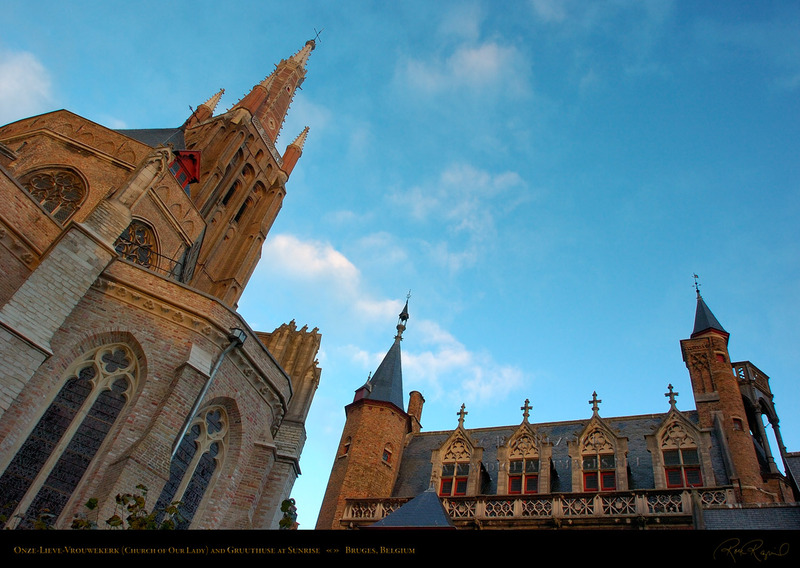 Another early morning vignette (different light and sky). A mid-morning vignette, different day, clear blue sky. at left, the Brickwork Tower, and the Gruuthuse on the right. 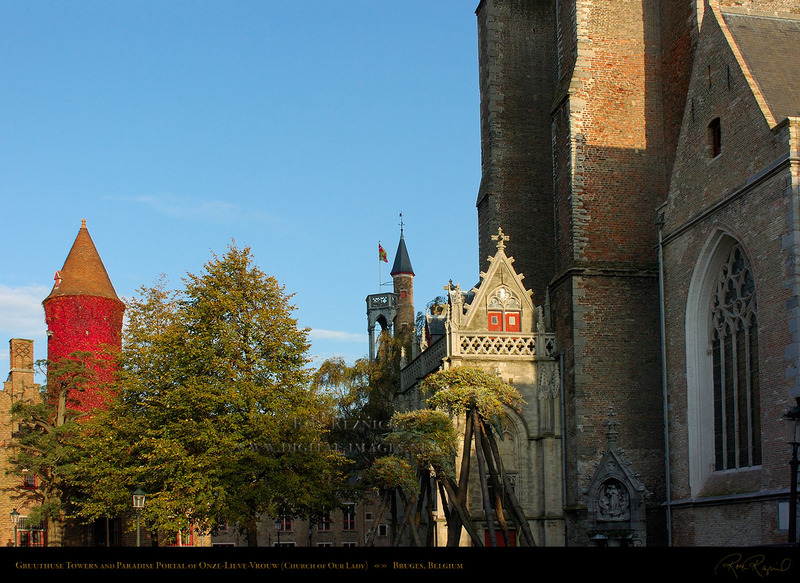 the end of the Bonifacius Bridge and the Gruuthuse complex. 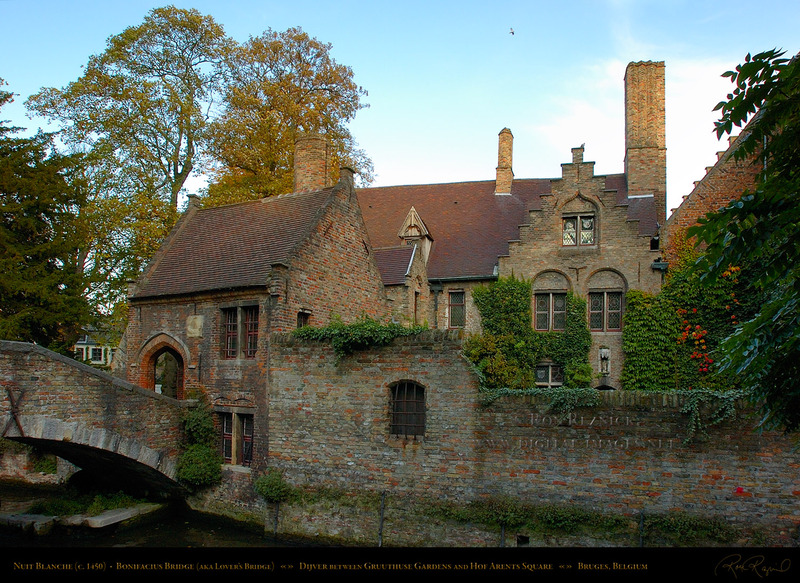 The Nuit Blanche house and the Bonifacius Bridge over the Dijver Canal. the reputed founder of the earliest church on the site of OLV (St. Boniface, 680-754). originally built c. 1450, rebuilt in the 17th century, and now a guesthouse. 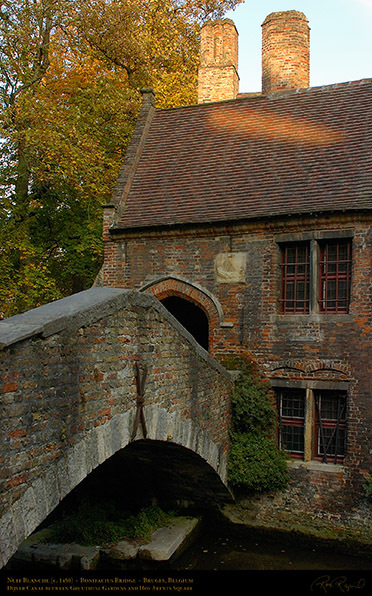 The sandstone brick wall at the end of the Bonifacius Bridge is pierced by a depressed Gothic Archway. 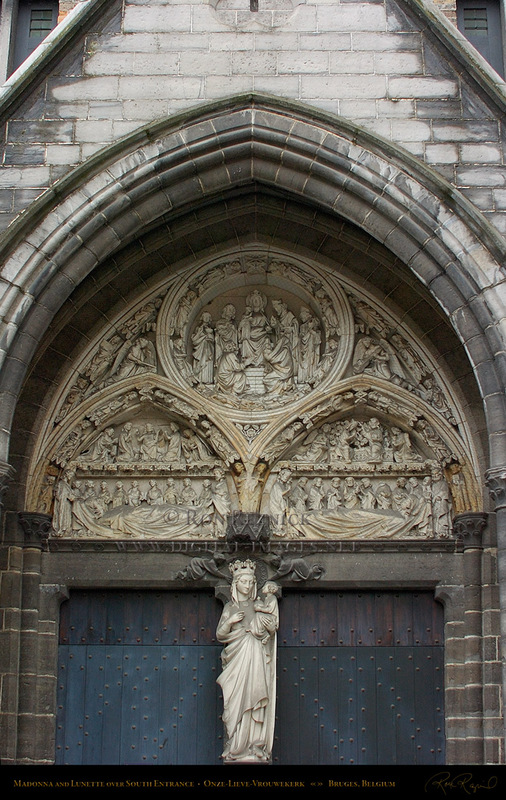 I used the floor of this archway as a platform when creating the vignettes shown at the end of the section on Onze-Lieve-Vrouwekerk. The old brick of the Bonifacius Bridge matches the house exceptionally well. 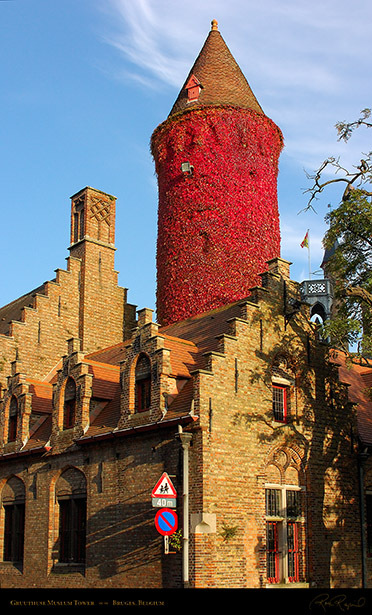 I am sure that it was specially selected. I was training a group of photographers while in Bruges, and Nuit Blanche became one of our favorite subjects. The combination of architectural elements and the difficulty of achieving a perfect exposure made this scene popular. 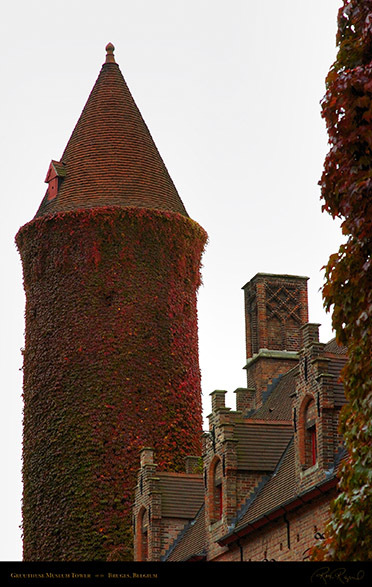 hold the color in the sky required dancing a fine line between overexposure and underexposure. I suppose you can see what I mean regarding the sky color. 1/3 stop more and you start losing the sky, 1/3 stop less and the color in the bricks becomes dull. 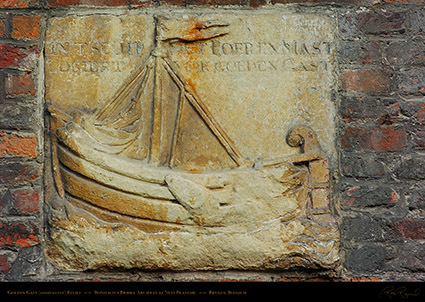 Shot 2731 was easier as there was more light on the house and softer light in the sky. 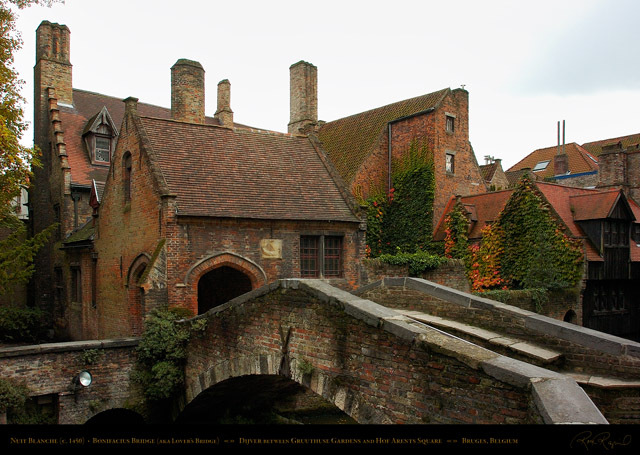 The medieval Nuit Blanche house and the Bonifacius Bridge over the Dijver Canal. Two images showing side detail of Nuit Blanche including dormers and windows with medieval crown glass inserts. 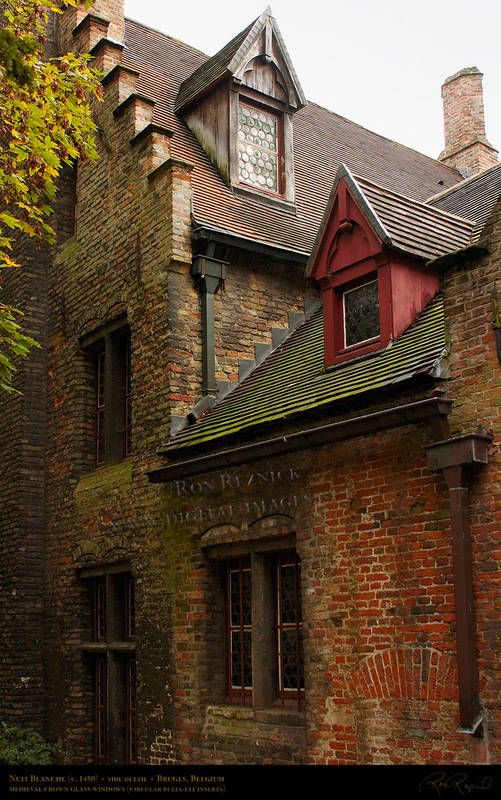 This style was typical before plate glass became economical. Crown glass was made by glassblowers, who spun the bowls to create the bulls-eye inserts and assembled them by hand. 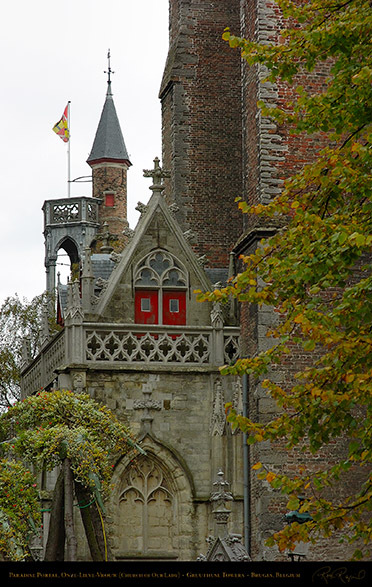 and the Paradise Portal of Onze-Lieve-Vrouw (in Brabant Gothic style, 1465). and one of the Gothic windows of Onze-Lieve-Vrouwekerk north side nave. The Paradise Portal (1465), built in the late Brabant Gothic style, was attached to the Mariastraat portal to reduce traffic strain. It is built of white sandstone, with a decorative top list and triangular Winberg topped with a finial. 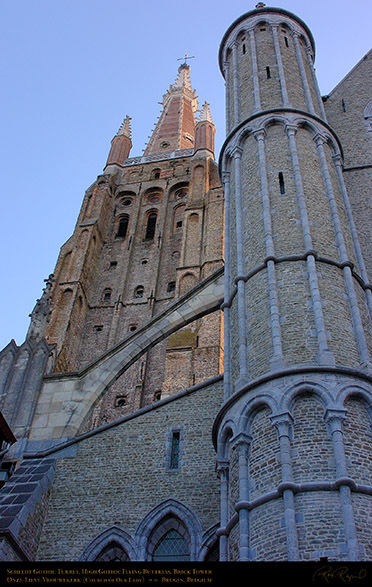 Narrow buttresses support the corners, each section topped with a pinnacle. 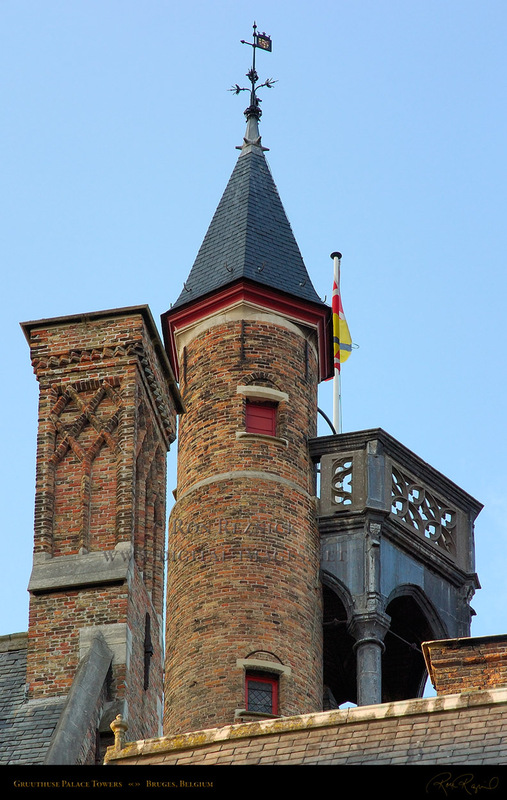 A detail shot of the Gruuthuse Palace Towers and the upper structures of the Paradise Portal. As the need for the portal tapered off by the early 19th century, the space was converted into a Baptismal Chapel in 1830. 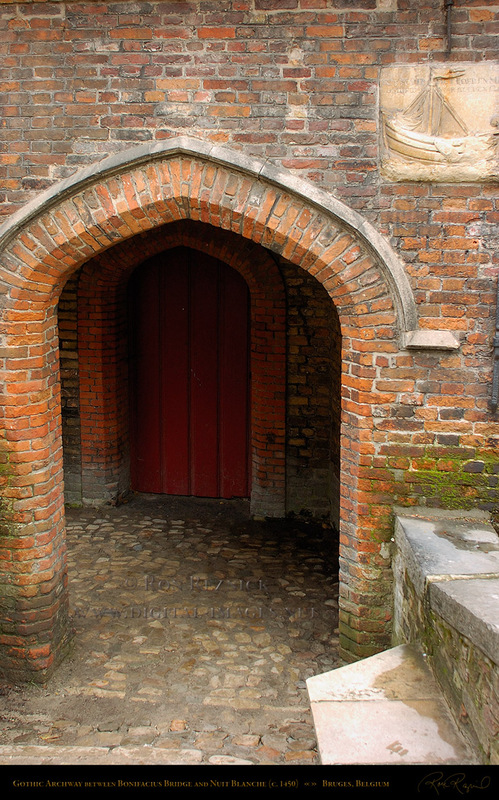 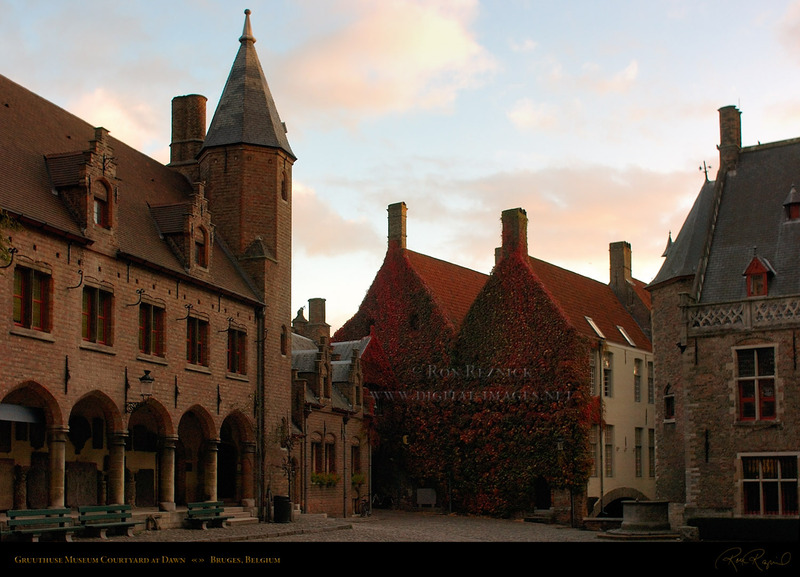 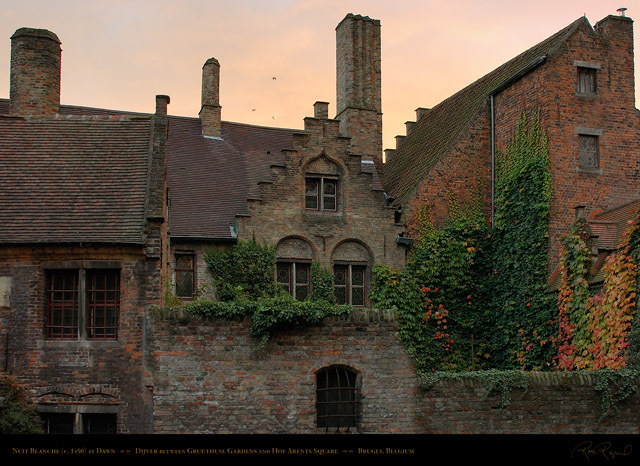 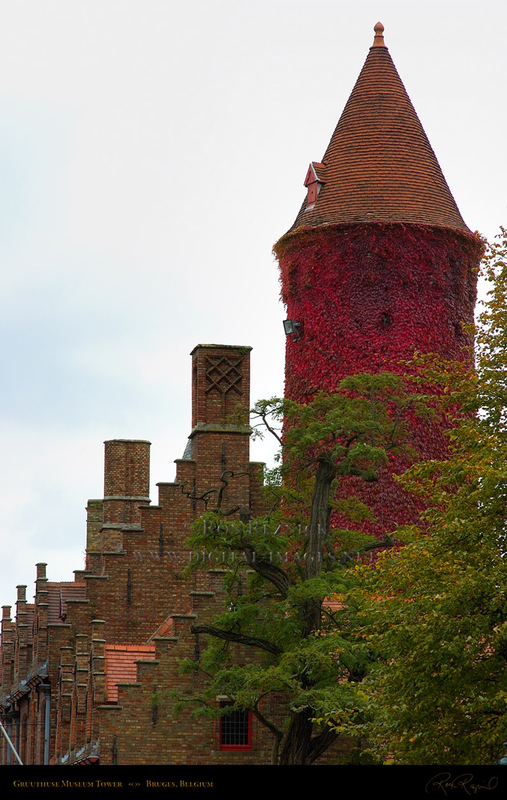 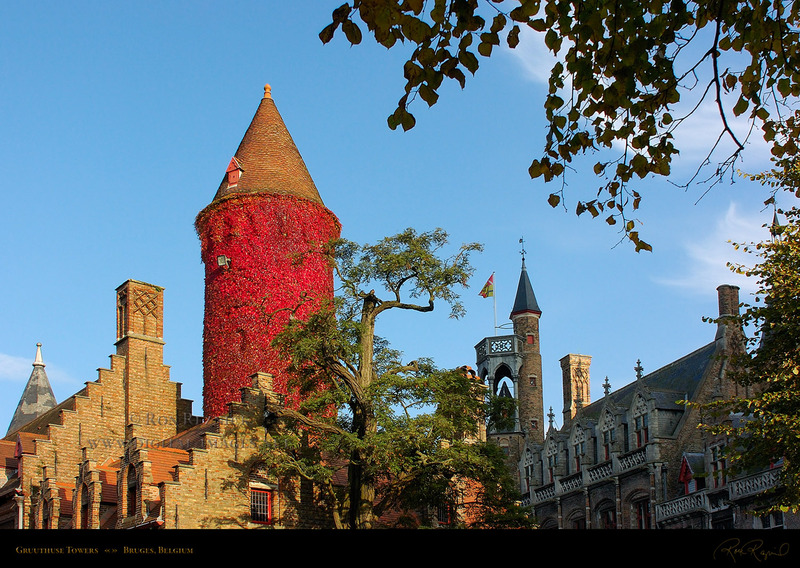 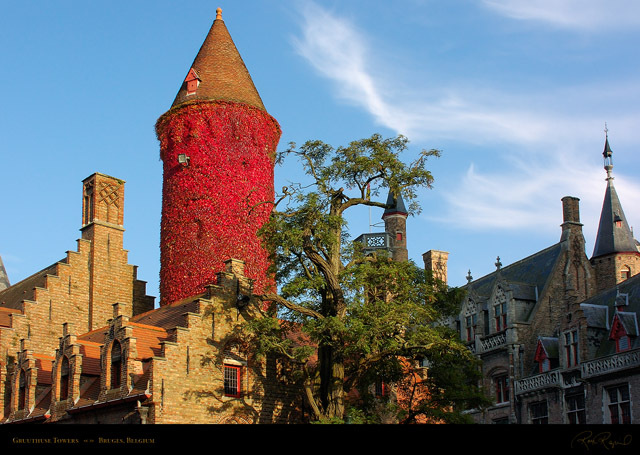 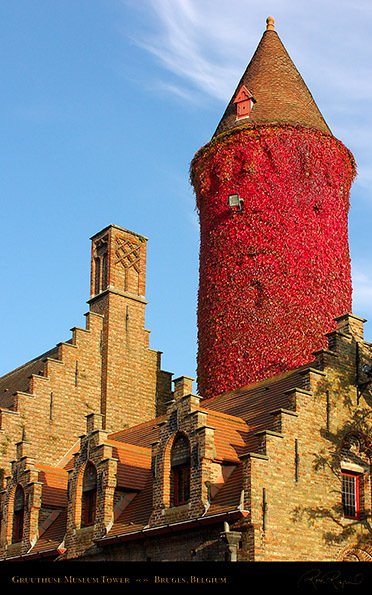 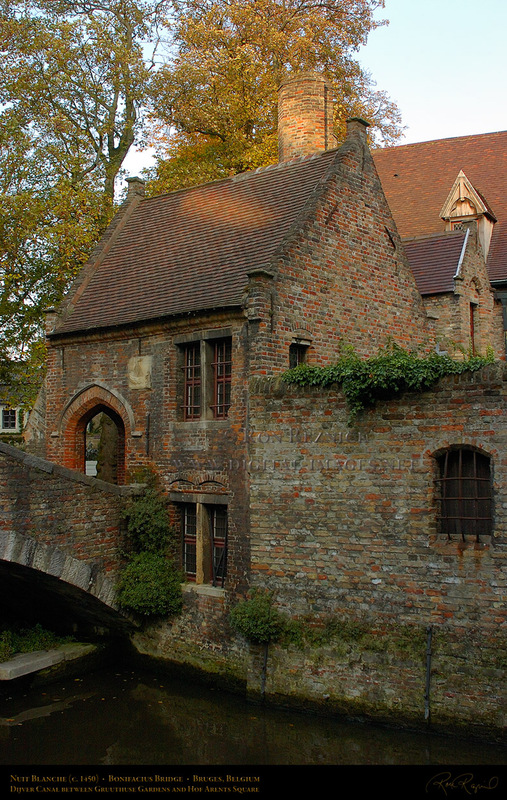 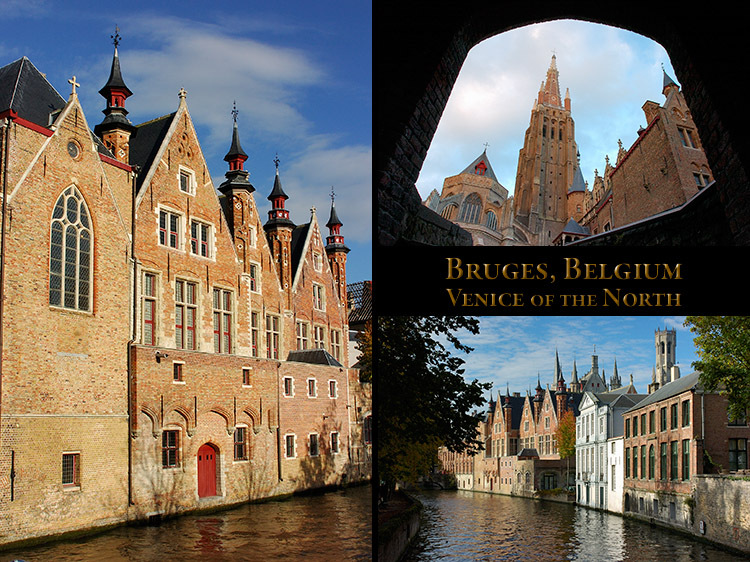 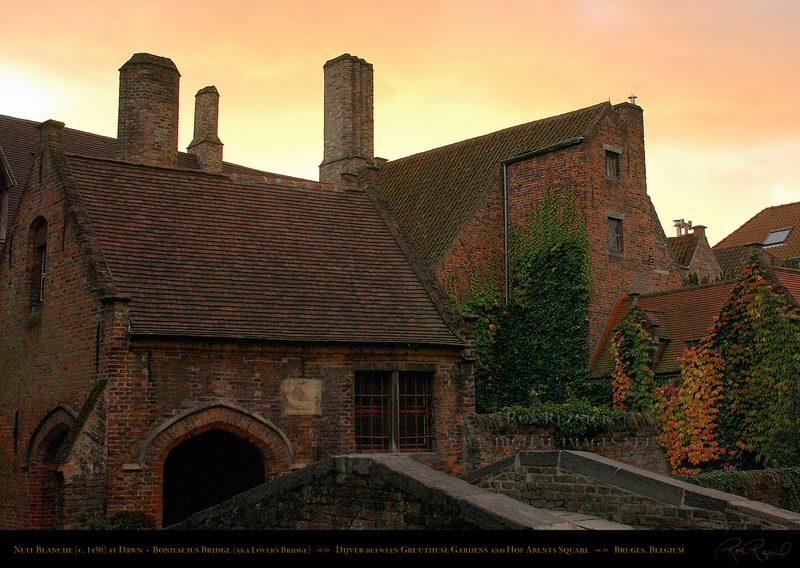 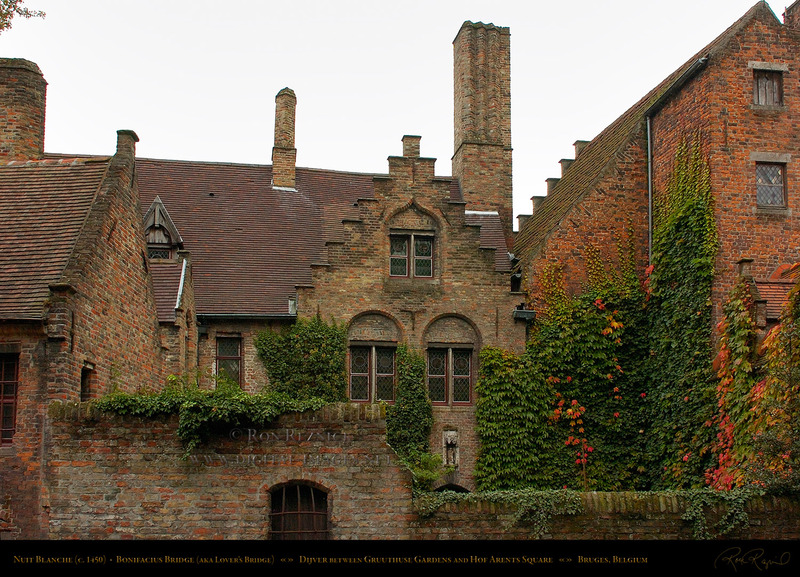 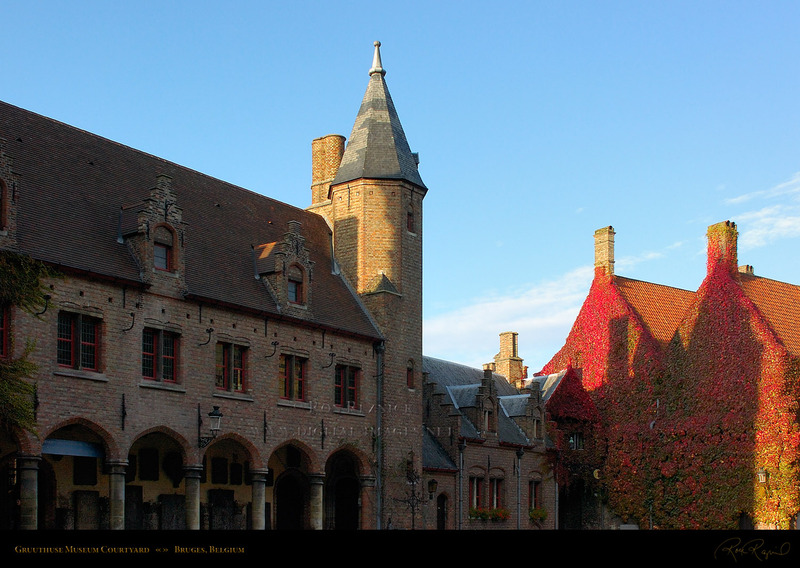 The Paradise Portal is considered to be one of the architectural wonders of Bruges. taken from the street beyond the Gruuthuse Palace complex (shown further below). The Gruuthuse Palace Towers from the garden behind Onze-Lieve-Vrouwekerk. 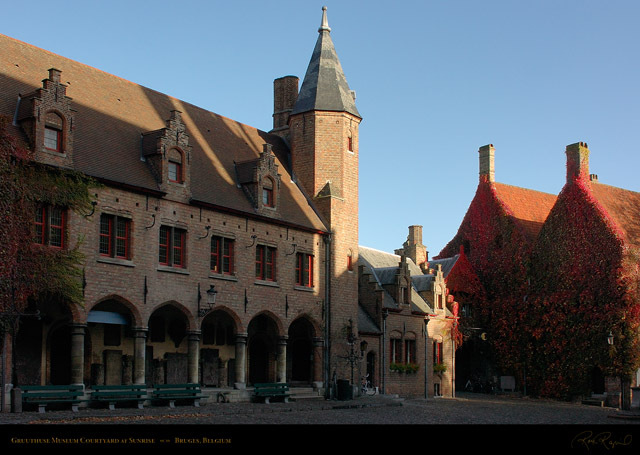 Gruuthuse Museum, shot from Guido Gezelleplein. Gruuthuse Museum shot from the Courtyard. The Courtyard of the Gruuthuse Museum at sunrise, with the red ivy covered Arentshuis at right. 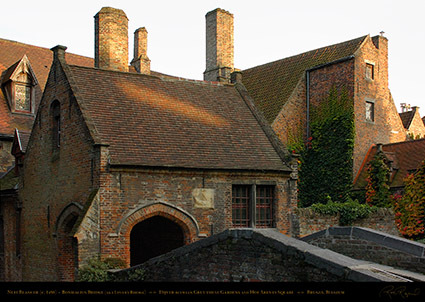 The Stair Tower at sunrise from the Courtyard entrance. The Octagonal Tower and Arentshuis in magnificent light. 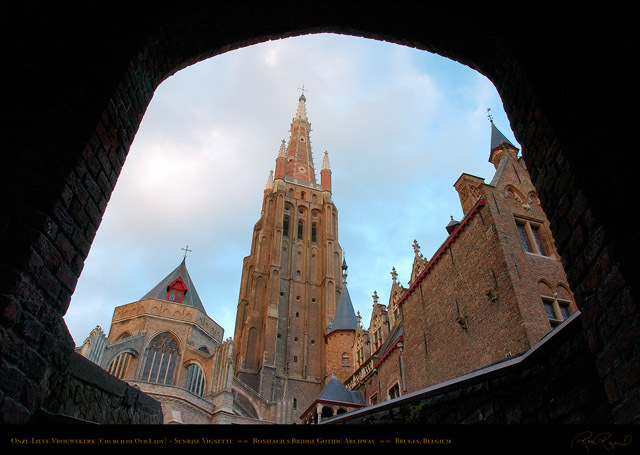 These two similar angles were taken on different days. The image above was shot about an hour after sunrise. Courtyard and just as the rising sun was painting the clouds. 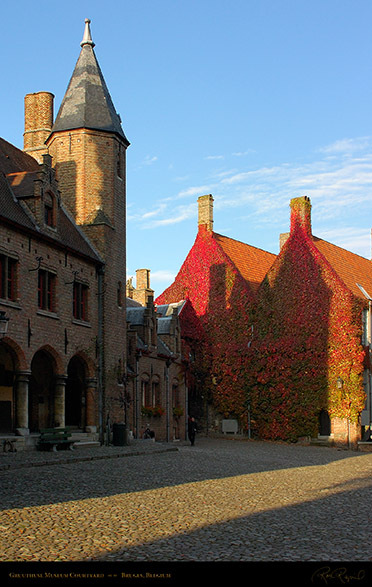 complex was built in the middle of the 15th century. The Gruuthuse Palace in the afternoon. By 1596, the invention of Hops-based beer eliminated the monopoly on Gruut and caused the family’s fortunes to turn. 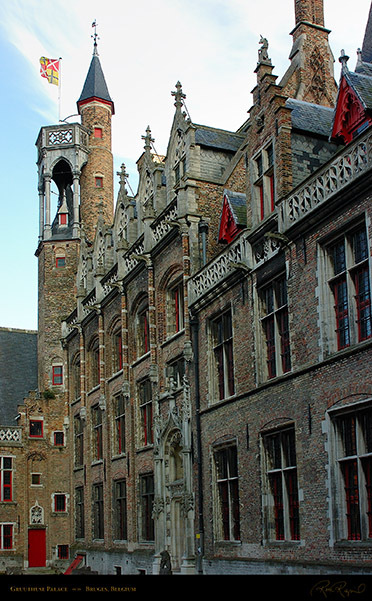 The Gruuthuse complex was sold to Philip IV of Spain, who gave it away in 1623. The Towers of the Gruuthuse Museum and Palace, seen from Guido Gezelleplein. 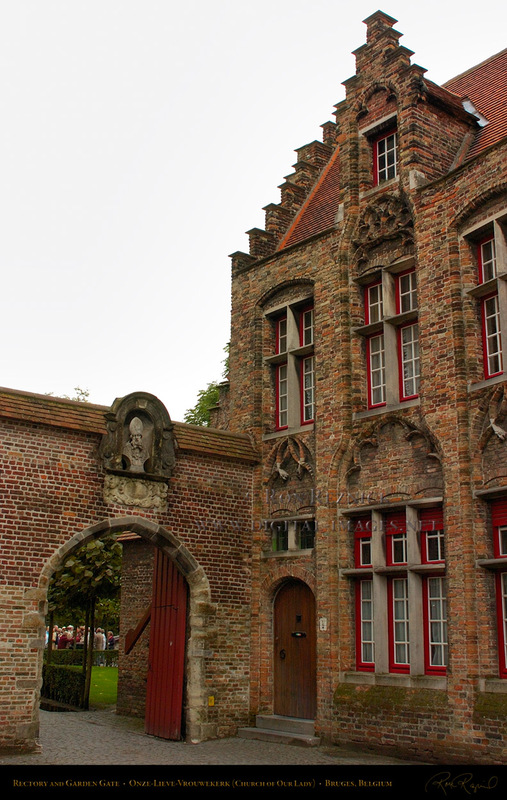 into the city archaeological museum, displaying lace, tapestries, etc. 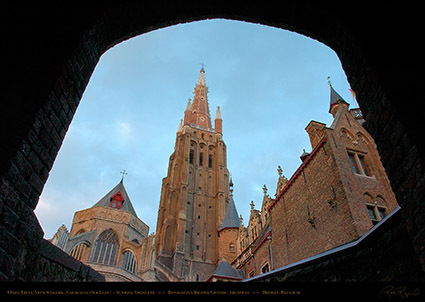 taken from the Guido Gezelleplein in magnificent light. 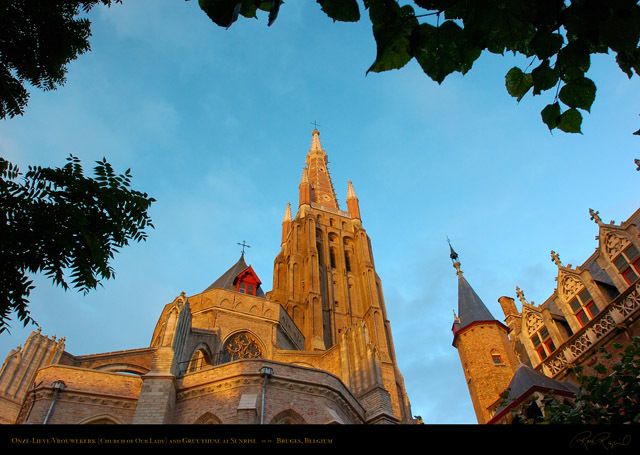 in the golden rays of sunset from the Guido Gezelleplein. 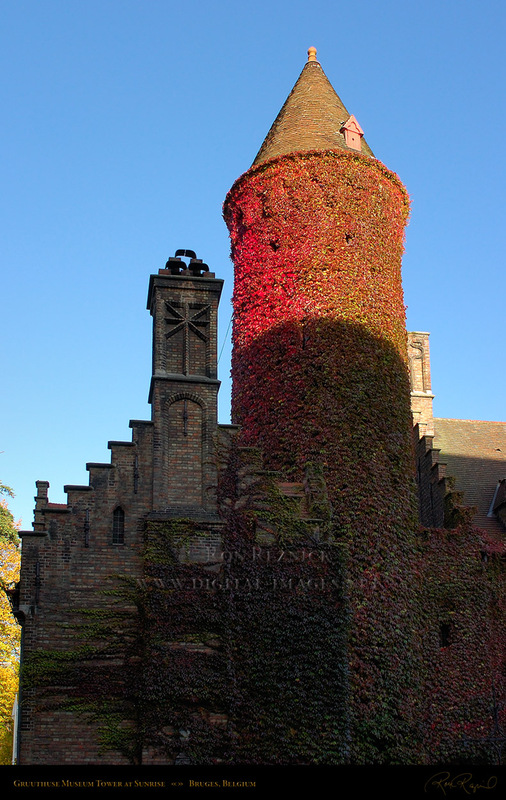 The red ivy on the Tower flouresced brilliantly in the light. 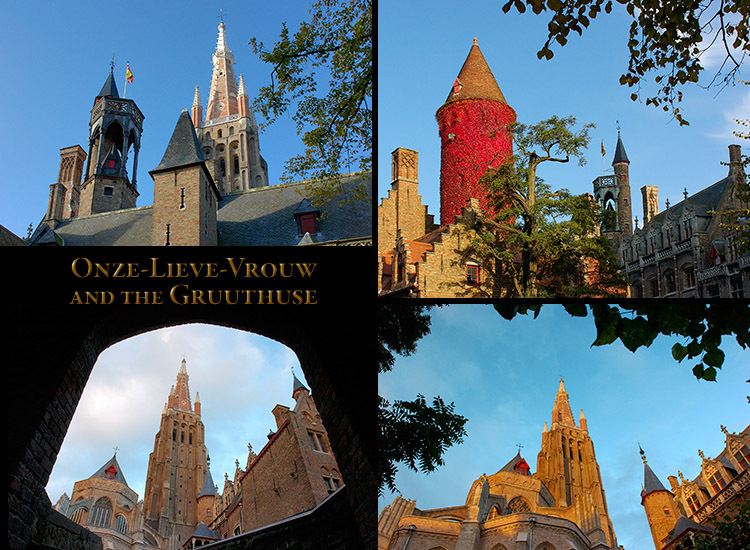 The Gruuthuse Museum and Palace Towers in the golden rays of sunset from the Guido Gezelleplein.